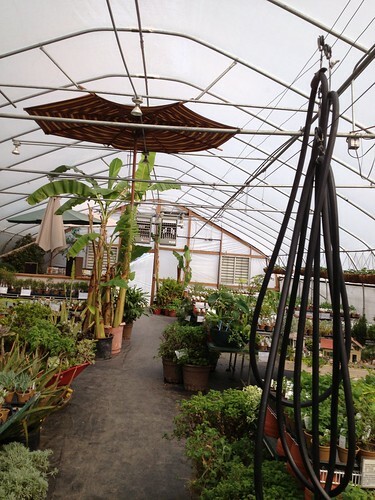 A friend handed me a catalog and encouraged me to visit Huron’s Mulberry Creek Herb Farm. I poured through their catalog and headed over just after they opened for the season a week or so ago (map). They had a ton of cool, interesting plants. 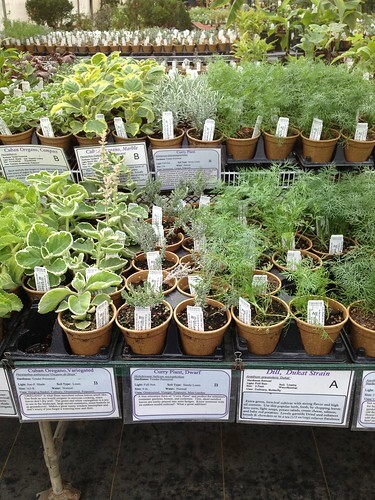 For example, they didn’t just have pots of oregano, they had about seven different oregano varieties … and their staff can guide you through the finer details of each oregano variety and point out their favorites. We are new to the Lake Erie shores in a new-to-us home with a huge backyard that’s ripe for some tender garden love. But, it has some difficulties with standing water when it rains (ie, we have a “seasonal” pond that might be perfect for a rain garden) plus the soil is in need of help. Co-owner Mark Langan took a look at my photos and said I needed to add two things to help my soil. “Spread some peat moss on your lawn, really thin, so the blades of grass peek up through the peat moss, and then spread about four bags of gypsum on top of that.” He said the peat moss would bring the worms up and they would naturally aerate our badly compacted soil, and the gypsum would give us some needed minerals. 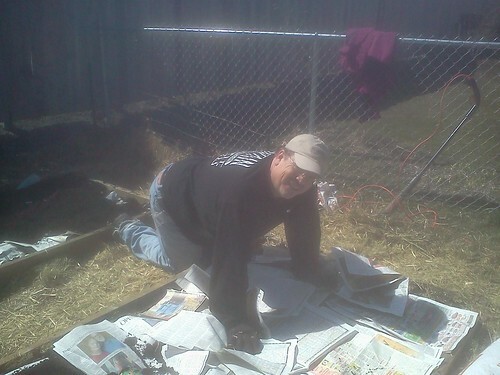 He recommended we add the gypsum to the lawn and the veggie garden. So, I did. I’ll let you know how it turns out. The woman working the register, a seasonal staff person, was also very knowledgeable. I told her about my hope of “living curtains” for our gorgeous tall windows that face a heat-producing asphalt parking lot. She recommended everbearing strawberries and seeds of Hyacinth Bean whose blossoms are edible (and quite delicious from my taste-test). She also guided me to a wonderful citrus-tasting flowering plant whose name I can’t remember. Some of this plant is shade-loving and some sun-loving. “Whatever nature provides” was a favorite phrase of my lawyer dad. It’s a phrase I try to live by when I can.I got my veggie beds ready this past week – using some tips from British gardener Cassandra Danz (Mrs. Greenthumbs Plows Ahead: Five Steps to the Drop-Dead Gorgeous Garden of Your Dreams) whose simple approach to gardening and humorous writing style fit my gardening philosophy. My favorite tip of hers? 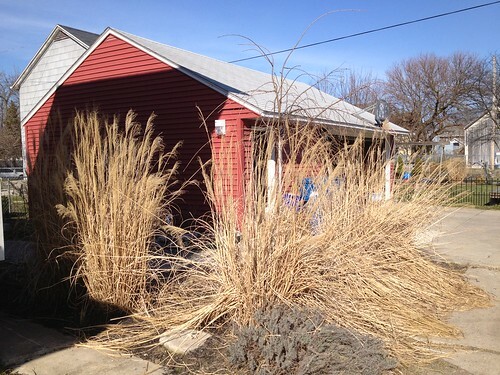 Don’t spend tons of time weeding out large areas, let nature do it for you! Just cover the offending areas with two-three sheets of newspaper, cover that with mulch or whatever you have to keep it down, then let the dearth of sunlight do its work. After adding peat moss and compost manure to our existing vegetable beds (I’ve never had raised beds so I’m excited!) 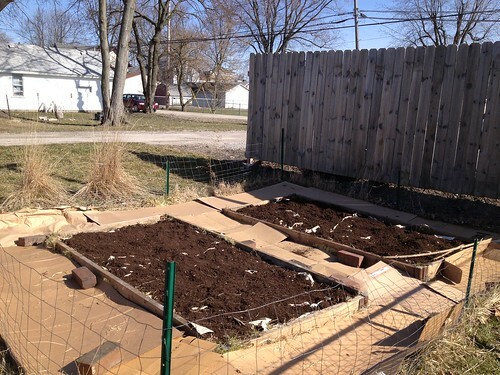 I added some newspaper, topped that with compost so the beds will be ready in a few weeks for our veggies. Last year we had a ton of grass that grew around the beds, so we whacked it close to the ground with a weedeater. Since I didn’t have any mulch on hand, I looked around for what I could use and saw leftover cardboard boxes from our move to Ohio. Perfect! In about a week I”ll have some “straw” from our maidengrass that I can lay on top of the cardboard. Thanks for taking time to notice the work and knowledge of our staff. We are blessed indeed!